The showcase of scary stories adapted for the theater runs through Nov. 4 at Portland Stage's black box studio. It’s the time of year when leaves are falling and nights lengthening, igniting the same fears of death and darkness that have prompted humans to celebrate Halloween. “The Haunting Hour,” a tapestry of performances at Portland Stage’s black box studio running through Nov. 4, is based on various stories from Maine authors and playwrights, including John Cariani, Tess Gerritsen, Chris Holm, Ike Hamill and Callie Kimball, plus one of the state’s monster writers who wasn’t named. WHERE: Portland Stage Company Studio Series, 25A Forest Ave. It isn’t just the stories that vary; the production includes puppets and shadow play, revealing that the only thing creepier than a puppet is a hungry puppet, controlled by black-clad, face-masked puppeteers. This production is not for small children, who needn’t be subjected to any of the kinds of treats this show has on offer. The rustic, irregular set by Meg Anderson provides a flexible backdrop. 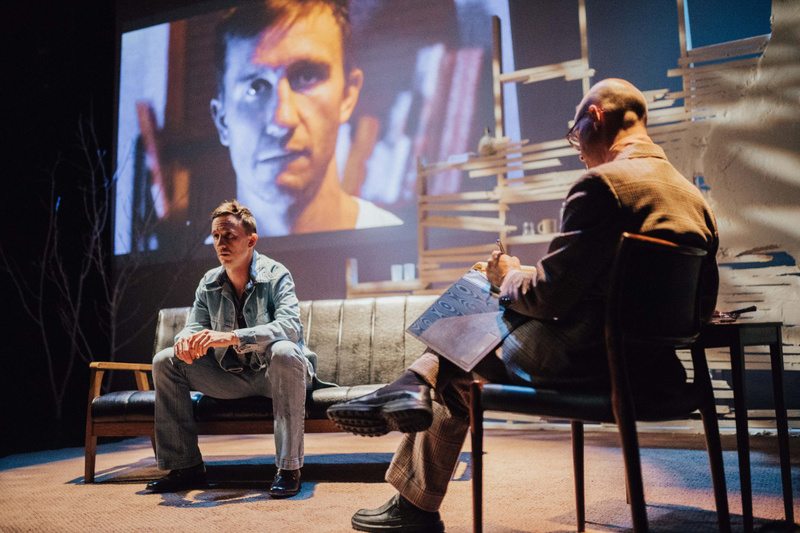 Lighting designer Corey Anderson, who isn’t above using the old flashlight-in-the-face trick, employs light and darkness, and sound designer Seth Asa Sengel employs silence and sound, both to maximum effect. The stagecraft abets masterful performances, and the actors – Kip “Chris” Davis, Moira Driscoll, Sean Ramey and Sally Wood in diverse roles – each demonstrate the ability to embody wildly different characters – grounded, ghostly and sometimes freaky. The pace is rapid but never rushed, and Driscoll’s comic timing is particularly satisfying. This is a troupe unafraid to juxtapose ooze with breakfast food. A lo-fi slideshow presented, commercial interruption-style, in increasingly more harrowing increments, injects hilarity and dread in one menacing tale of how stubborn denial can lead to horror, a fitting warning for our times. Curated and directed by Dustin Tucker, these stories aren’t exactly complex – no need when tapping into our most primitive anxieties – but the staging boasts intricate design and multi-tasking that make these disparate tales cohere into a haunting joy. One leads to another with ease, as in a dream – or a nightmare. Daphne Howland is a freelance writer based in Portland.